Chloe placing 3rd and winning a Bronze medal at the November North American Cup competition. So, Chloe, when did you start fencing and what got you into this intense sport? Since the time I was three years old, I can remember chasing my dad around the house with foam swords, sometimes attacking with pool noodles, too! So, after spending the rest of the summer fencing, my mom sought out training to start me on my Olympic pursuit. At the suggestion of a family friend, she brought me to a fencing club that proudly claims it has been “[t]raining Olympians since 1990.” There, I can practice with a saber (just like the one featured in our Cavalier logo! ), which is faster and more exciting than training with a traditional foil. I have been fencing ever since and will continue to pursue my Olympic dream with my club, Nellya Fencers. What do you enjoy most about fencing? I love the uniqueness of the sport and the opportunities to see the world as well as having the chance to create new memories and friendships. I really like the unity in the individualism of the sport — I receive a lot of support from my teammates and have the opportunity to support them. Fencing has also taught me discipline, patience and ambition. The complexity of the sport challenges me mentally and physically. How do you balance this labor-intensive sport against our rigorous curriculum? With the support of my ACA friends and our amazing teachers and principal (shout out to Mr. Knowles! ), I somehow manage to stay academically up to speed while chasing people with sharp objects! You’re so dedicated to your school work! I know we’ve talked about how you study during your flights, four-hour practices, and before competitions, finding anytime in between to manage a heavy academic workload. Yes, though I have missed blocks of school this semester to compete in back-to-back competitions — a World Cup in Budapest, Hungary, and a North American Cup in Wisconsin — I still managed to make high honor roll! I was so relieved and excited to see my hard work pay off despite so much travel. 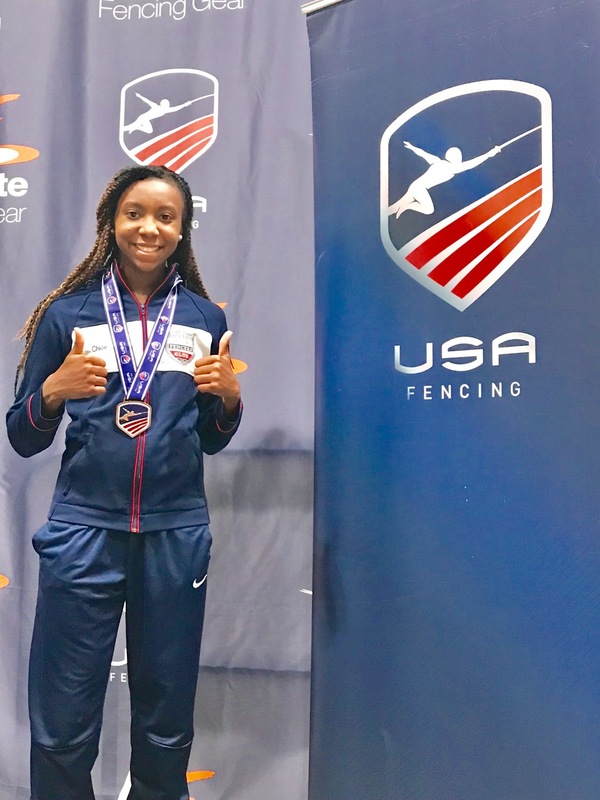 Well, you love fencing, but it has caused you to miss out on some fun school events, including this year’s 9th grade trip to Washington D.C.! So true. However, my goal is important to me and traveling to Hungary isn’t so bad either. I’m grateful to have friends all over and especially at school. It helps to stay connected. What is the hardest part about the sport of fencing? Though fencing is a joy for me, it requires me to keep a lot of rules and actions in my mind while still trying to stay focused on the challenge at hand. It also takes a lot out of me physically because it requires a lot of stamina. As many people have said, fencing is the physical version of chess. Yes, as the Latin phrase goes: Perseverantia omnia vincit. Perseverance conquers all things.